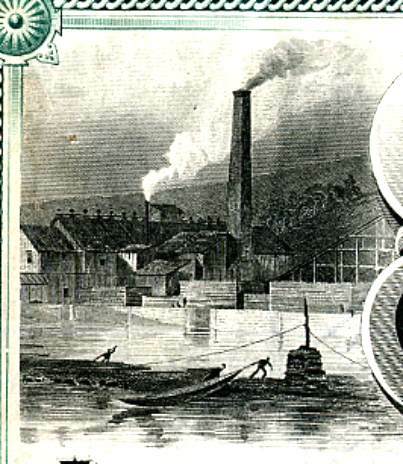 Beautifully engraved certificate from the Seattle Lake Shore and Eastern Railway Company issued in 1889. 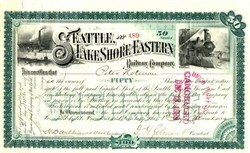 This historic document was printed by the Franklin Bank Note Company and has an ornate border around it with vignettes of a lake and a train. This item is hand signed by the Company's V. President ( Daniel H. Gilman ) and is over 115 years old. The Seattle, Lake Shore & Eastern Railroad was a railroad founded in Seattle, Washington on April 15, 1885. It was taken over by the Northern Pacific Railway in 1892. The Seattle, Lake Shore & Eastern was started by a group of men headed by Thomas Burke and Daniel Gilman with the purpose of creating a rail connection between Seattle and the Canadian Pacific Railway. 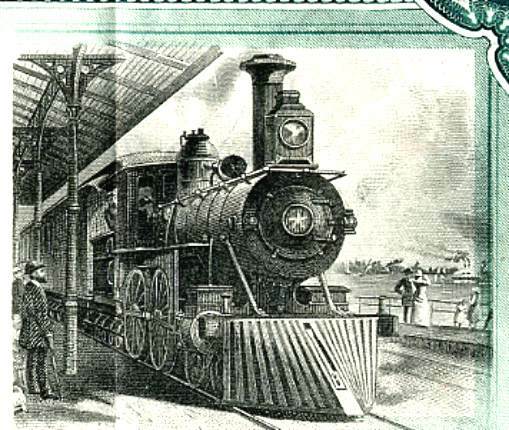 In 1885 Judge Thomas Burke, Daniel Gilman and ten other investors set out to establish a Seattle-based railroad so that the young city might win a place among major transportation centers and reap the economic benefits of trade. Their plan was to start along today's Burke-Gilman Trail route and go north to Sumas and connect with the Canadian Transcontinental line. Their Seattle, Lake Shore and Eastern Railroad, though it never got past Arlington, Washington, was a major regional line serving Puget Sound logging areas. The line was aquired by Northern Pacific in 1913 and continued in fairly heavy use until 1963. The Great Northern, Northern Pacific, and Burlington lines were merged in 1970 to become Burlington Northern Railroad. In 1971 Burlington Northern applied to abandon the line.